The presidency of the Brussels Agricultural Society is still up in the air after the organization held its annual meeting on Friday night as there were no takers for the top position. Dorothy Cummings is the current president, serving in the second year of a two-year term. This is the third time she has been president, once serving as president for seven years in what was supposed to be a two-year term. Jeff Cardiff, another past-president of the organization, called for nominations, reaching back to last year’s nominations to try and continue the lineage of presidency of the organization. Without anyone in that position, Cardiff asked for nominations for someone to be the vice-president for one year under Cummings and then, in 2020, move into the president’s role for the 2020 and 2021 Brussels Fall Fairs. Though many were nominated, no one accepted the nomination and the position remains vacant. Cardiff, who has been president twice, said it’s an excellent organization with many volunteers willing to give their time, it just needs a leader and the position does take some time. Finding no success in asking for nominations for the vice-president role, he went so far as to ask for nominations for a second vice-president, who would then be on track to be president for the 2022 and 2023 Brussels Fall Fairs. There were no takers for that position either. Cardiff then dropped the nominations, but said that the presidency of the organization would have to be addressed soon, as it would be unfair to Cummings to stay on for a third year with all of the time she’s dedicated to the society. The next meeting of the Brussels Agricultural Society is set for Wednesday, March 6 at 7:30 p.m. at the Brussels Library. The theme for the 2020 Brussels Fall Fair will be “Twist and Sprout” thanks to a vote taken at the Brussels Agricultural Society’s annual meeting on Friday night. The theme was one of five considered for the 2020 fair that night. The second-place theme, “Bank Barns and Spinning Yarns”, however, was documented by Secretary Brian Schlosser. President Dorothy Cummings asked him to make note of the theme, because it’s a good one and it should be strongly considered as the theme for the 2021 fair. Other themes in contention were: Barn Beams and Ice Cream, Very Berry Extraordinary and Pigs and Big Rigs. The theme for this year’s Brussels Fall Fair, decided at last year’s annual meeting, is “Back to Our Roots”. Ally Riegling was the winner of the David and Joan Perrie Award for the most points in the Junior section of the 2018 Brussels Fall Fair. The award was presented at the annual meeting on Friday night by the Perries. 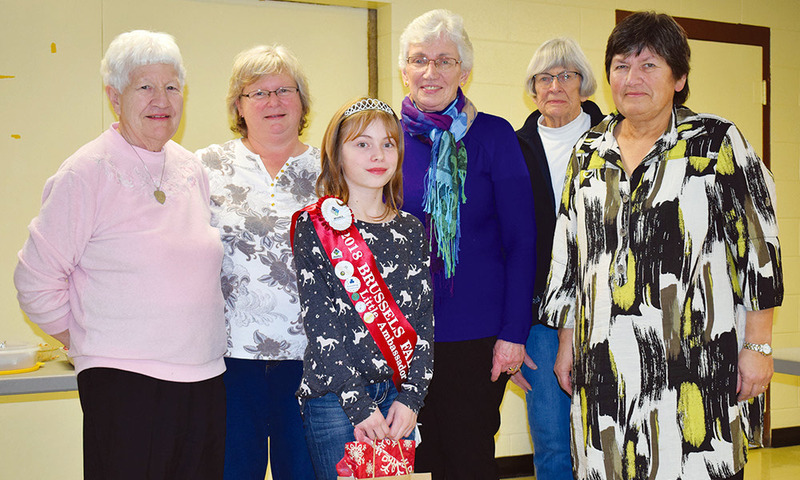 Kaleigh McCallum, the Brussels Fall Fair Little Ambassador, was the winner of the Brussels Optimists All-Around Participation Award for the most points in both the Junior and General sections of the 2018 Brussels Fall Fair combined. The Optimists Award was presented by Cathy Cardiff, Yvonne Knight, Jean Davidson, Joan Perrie and Linda Garland. Monique Baan began her time as the Brussels Agricultural Society’s home craft president at the annual meeting. She will hold the office for the next two years. Pam McLellan accepted the nomination for the position of first vice-home craft president. Brian Schlosser will again serve as the organization’s secretary/treasurer and the society’s books will again be audited by Ralph Watson and Peter Allison. 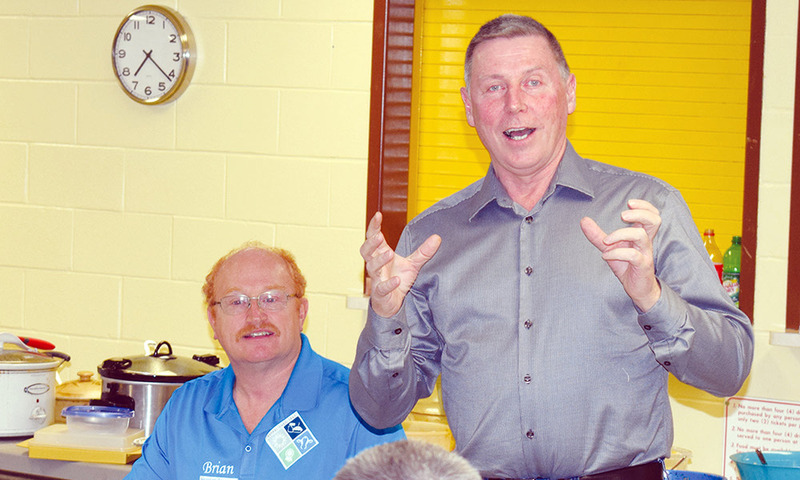 After a successful, sold-out dinner to kick off last year’s Brussels Fall Fair, members of the Brussels Agricultural Society decided to again hold a meal on the Tuesday night of the fair this year.